JP Steel Plantech Co. (SPCO) and CMI Industry Metals, a division of Cockerill Maintenance & Ingénierie SA (CMI), have been discussing about a strategic cooperation between both companies dedicated to the global steel market. 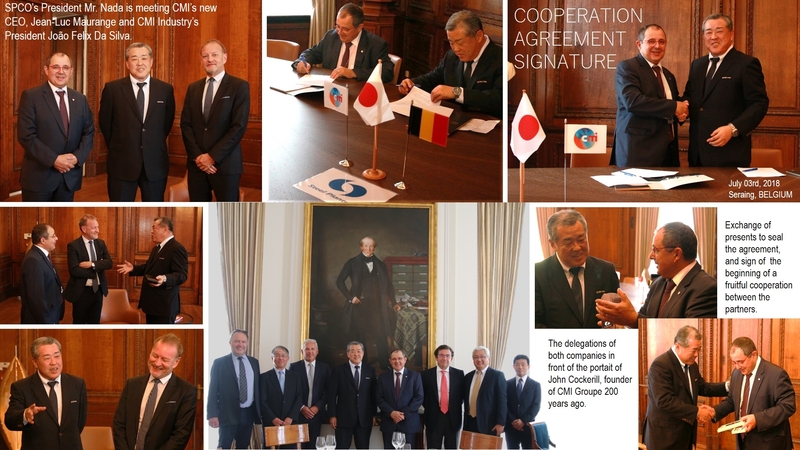 As such, SPCO and CMI have signed a “Cooperation Agreement” on July 03rd, 2018 at CMI’s headquarter in Seraing, Belgium. The Agreement will be focusing on the combined marketing of both companies’ unique technologies and enables both partners to make advantage of their respective organizations with the goal to render their offerings unparalleled and the most attractive in the market place. With the growing demand for high quality and high strength steel grades and the ongoing consolidation of steelmakers, this market segment is going to considerably grow. The increasingly international steelmakers require, next to technically adapted solutions, a worldwide service, as well as local sourcing and manufacturing from its suppliers. In order to most adequately adapt to this trend, both companies are seeking to complete their portfolios, enabling them to offer an integrated and global solution for steelmakers worldwide. As such, the partners have decided to extend their respective business models and to combine both companies’ marketing efforts, focusing on complete, high quality Pickling Lines with Tandem Cold Mills for the steel industry and particularly the Advanced High Strength Steel (AHSS) market segment. The cooperation is also to help the partners expand their geographic coverage, as well as complete their product and servicing offerings. Both SPCO and CMI bring their longstanding experience and market recognition into the partnership. While SPCO can display references for its unique well established and respected Continuous Cold Rolling technologies and the most advanced Tension Levelers for AHSS and Plate Leveler, CMI is adding leading steel process know-how and technologies with a worldwide reputation in Reversing Cold Rolling, Pickling and Galvanizing, as well as its global network and high standard production facilities in India and the USA to the cooperation. “With the combined technology, know-how and capabilities of both SPCO and CMI, we will be able to even better serve our customers with leading downstream technologies, while strengthening both companies position as technological front runners in their respective segment.” said Joao Felix Da Silva, Executive President of CMI’s Industry Sector and member of the Group’s Executive Committee. This unique combination of process know how and worldwide, yet local presence and service, as well as the resulting optimized technical solutions and leverage of synergies will not only increase both partners cost competitiveness, but will be guaranteeing our global customers an extended value proposition for their plant. As for further detail information, please click here. Founded in 1817 and following in the footsteps of its founder, John Cockerill, the CMI Group is developing innovative and pragmatic solutions to tackle the challenges of its age. This has led it to design, integrate, modernize and maintain equipment for energy, defense, steel-making, the environment, transport and industry in general. Present on all five continents, CMI numbers more than 5,500 experienced employees who combine expertise in engineering, maintenance and the management of technical international projects. CMI INDUSTRY METALS designs, supplies and modernizes cold rolling mills, processing lines, chemical and thermal treatment installations for the steel and the non-ferrous industry. Based on decades of experience and successfully running references all over the world, CMI Industry not only supplies Green- and Brownfield installations and equipment, but also provides the related services, as well as training and technical assistance.